Technology Corporate Management (Pty) Ltd (TCM) is one of South Africa’s largest privately-owned IT companies. Established in 1987, TCM’s experience, expertise and commitment to service excellence is matched by its agility and accent on innovation. Our areas of expertise include end user computing, data centre management, hosting, server consolidation, virtualisation, managed printing and supplies, hybrid IT (cloud), business continuity and networking. This is supported by our excellent support services, large scale deployment and high availability. TCM is well placed to provide fast, efficient and cost effective services throughout southern Africa, with branches in each of the country’s major centres (including Johannesburg, Durban, Port Elizabeth, Bloemfontein and Cape Town). TCM national footprint is augmented by the company's presence in 61 satellite areas within the country. The company’s unique structure enables it to deploy specialized skills nationwide, providing customised solutions and uptime services to our clients 24-hours, 7-days-a-week. 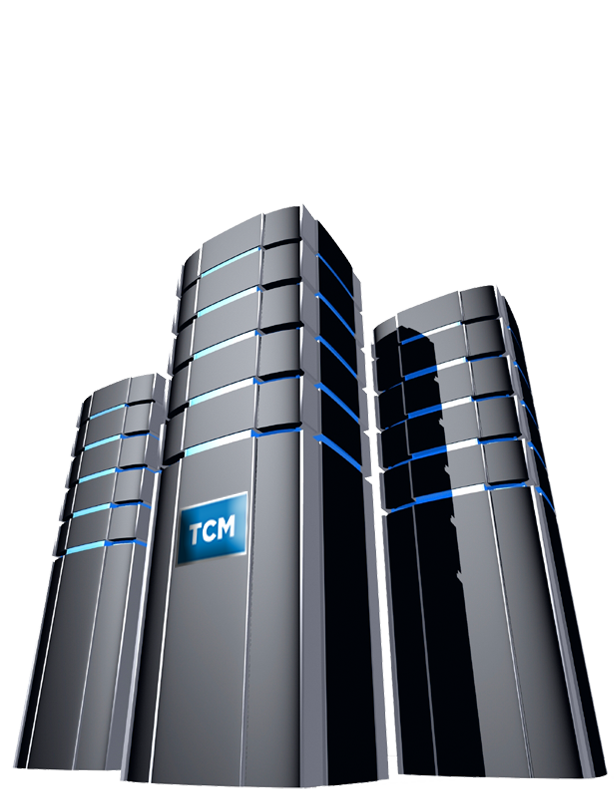 TCM has distinguished itself in a highly competitive industry by possessing the agility to meet client's requirements, to adapt in an ever-changing economic and corporate climate and by remaining ahead of change. TCM continues to display its commitment to social consciousness, which filters throughout the business operationally. This holistic approach is a driving force for TCM’s constant progress and achievement as a Black Economic Empowered Company (TCM is a Level 1 AAA BB-BEE contributor) delivering customized Information Technology solutions enabling customers to meet their objectives, alongside TCM remains a responsible corporate citizen in the South African and African economy. TCM strives to empower its customers to effectively monitor, manage and drive their business operations through the utilization of current IT concepts, technologies and services it is accredited to provide in solutions best suited for each individual customer. 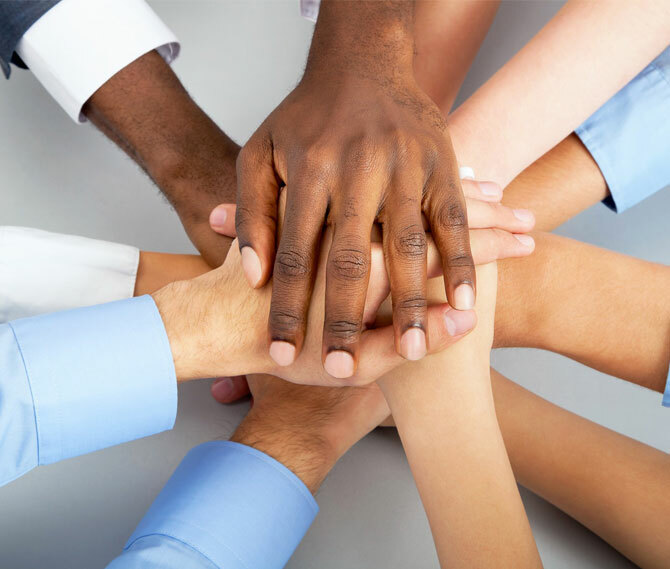 TCM aims to be a leader not only to our competitors but to our clients as well. TCM has always taken a holistic approach to actualizing its transformation and empowerment goals. A number of initiatives are in place to ensure TCM operates according to the spirit of transformation, all driven by the Company's commitment to social consciousness. The continuous application of this outlook sets it apart from its competitors and allows TCM to be a leader in the ICT industry. TCM is a B-BBEE Level 1 contributor with 135% procurement recognition from empowerment ratings agency EmpowerDex. The Company is 25.10% black-owned, and ownership by black females stands at 11.30%. A number of initiatives are in place to ensure TCM operates according to the spirit of transformation, all driven by the Company's committed social consciousness. TCM has always taken a holistic approach to actualizing its transformation and empowerment goals. A number of initiatives are in place to ensure TCM operates according to the spirit of transformation, all driven by the Company's commitment to social consciousness. The continuous application of this outlook sets it apart from its competitors and allows TCM to be a leader in the ICT industry. 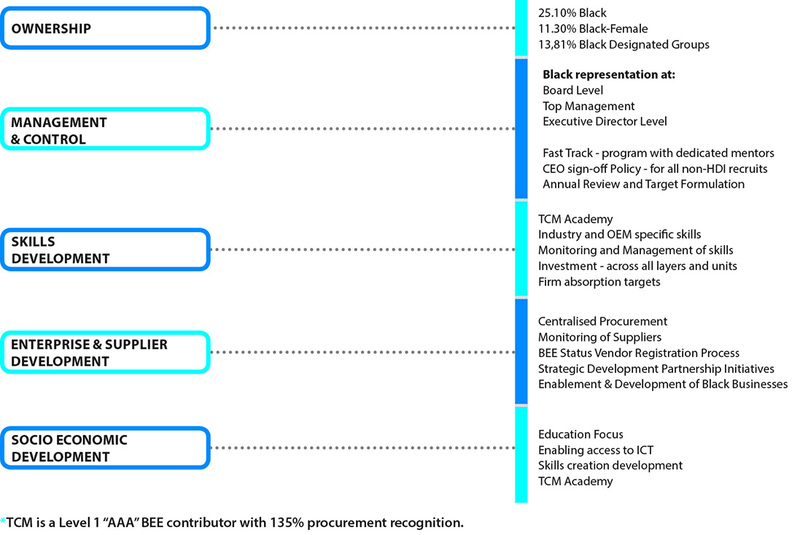 TCM is a B-BBEE Level 1 Contributor with 135% procurement recognition from empowerment ratings agency EmpowerDex. The Company is 25.10% black-owned, and ownership by black females stands at 11.30%. A number of initiatives are in place to ensure TCM operates according to the spirit of transformation, all driven by the Company's committed social consciousness. TCM's corporate social responsibility programme focuses on education and the environment. Projects are carefully selected according to their potential for effecting lasting change. Through its firm relationships with its vendors, TCM views itself as a member of an industry which is remodeling the way organizations do business and manage their operations. With this comes the responsibility of committing to skills development to effect the professional design, implementation and support of latest technologies. My name is Kutlwano Zitha, and I am 24years of age. I was raised by a single parent, who tried by all means to assist in making sure we fulfill all our goals and desires but with all the financial strains, unfortunately it was not all possible for her. I was first introduced to the TCM academy program by my uncle in 2013, who at the time was a technician at HP. I started with Cisco IT essentials, then in 2014 I finished my CCNA, and later on the year I was introduced to the MICT-SETA program, of which I finished in July 2015. I am currently a permanent employee at TCM and major in Administrative and Technical work (Desktop support). My name is Lucky Moalusi from Soweto . I joined TCM Academy on 2012 through Nelson Mandela Children’s Foundation. I started as a student enrolled in Cisco IT essential and went through to advanced networking (CCNA). I was further admitted and completed MICT System Support NQF Level 5. Hi my name is Thembi Lion. Being at the academy had played a huge role in life.I started at the academy in 2008 and that was the best opportunity I could have been given. I made sure that I used the opportunity I was given making it my first priority. Hi my name is Nkosinathi Emmanuel Khumalo. I was raised by my mother as a single parent coming from a disadvantage background. For as long as I can remember I have always had a love for computers as a result, I bought a computer with the money that I was suppose to use for my matric dance. After I completed my matric I wanted to study Information technology, but I didn’t have the funds to further my studies. I discovered a partnership was formed between TCM academy and TT. I applied and was fortunate to be given an opportunity to pursue my dreams. TCM has allowed me to gain qualifications in CISCO I.T Essentials and CCNA. I’m currently studying Microsoft system support at TCM academy. I am 20 years old whom after completing matric could not pursue a tertiary education because of financial circumstances. Since high school I have had a passion for I.T. I had learnt of Tomorrow Trust who is a partner of TCM which assists students gaining an education. I was very fortunate to have TCM/TCM Academy provide me with a chance to better my life.I have already completed CISCO courses at TCM Academy and still furthering my studies thanks to TCM, TCM Academy and the amazing staff!